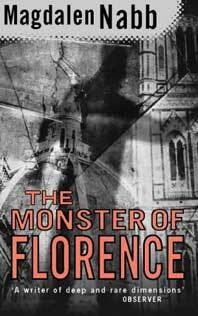 Q: Tell us why you wrote The Monster of Florence? Nabb: Well, I was very reluctant to write it. I wasnt ever going to do it. Partly because serial killers are so fashionable, arent they? Imagine using something like that to titillate and amuse. I couldnt quite get my mind around that one. And I also didnt want to do it because I thought, well, what on earth could someone like Guarnaccia have to with a case such as that. So that was my feeling about it. Q: Did your publisher ask you to do it? Anyway, the point was that when she couldnt come back for the appeal trial, the newspaper asked me to cover it. I didnt want anything to do with it but because it was Karen, I ended up covering the trial. Then Thomas Harris decided to come along and he infuriated the press by turning up in Florence and saying, Im not receiving any reporters, I dont want to talk to anybody. You know, Florentines are just not the type for this sort of thing. So he came to the trial and he walked up and down the courtroom very ostentatiously, being noticed by everybody. The newspapers here were so irritated by this that they actually published a big article saying that I had in fact hidden myself--not in the press box where I could have gone since I was reporting--but among the public so that I would be invisible. So the reporters wrote about this and added, Unlike some people who were swanning up and down the middle of the courtroom all day long, making sure theyre noticed and then being rude to the press. They were really annoyed. So, I followed the appeal trial and reported on it but still without intending to write a book. Then I got pulled further in. The huge investigation of these murders in the eighties when they were still happening had been ditched and a new one set up with a special squad of investigators, none of whom had been involved, none of whom knew the case from the beginning. The fact that none of them had ever in their lives investigated a murder of any kind caused people to suspectnot unreasonablythat this was a very odd sort of investigation and that the suspect was being framed. This annoyed a lot of people who had worked long and hard on the case and those people, looking for someone to tell, came to me with their anger and their evidence. I still wasnt convinced that I should write a book. I still couldnt see Guarnaccia being involved. Then I went to Pitti for some other reason and I rang the doorbell and the Marshal opened the door said, Oh, Ive been expecting you. He had heard I was interested and, as it turned out, he had found two of the bodies. My last defence was crumbling. I think what was critical was the setting up of the Anti-monster squad using people with no relevant experience. I could see Guarnaccia could easily be seen as not bright and not important and that he would fit into this squad of non-investigators very nicelyor seem to. From that point, I could not get away from it. I thought, Ive got to spend months and months on this trial, anyway, so Ill give in and write a book. But it was problematical, because it was so complicated and so long. 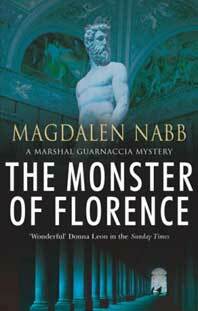 Q: Has The Monster of Florence been translated into Italian? Nabb: No, I dont think it will ever be translated. Because the polemic is still going on. Im still having trouble. I had trouble with the terrorist thing and Ive had lots of trouble with this one too. Q: Was the investigation you included in the book, the real one? Nabb: Yes, that was the real investigation. I had the documentation of the examining magistrate. What I did was I put Guarnaccia in the position I was in when I decided to investigate the investigation, and all this stuff was given to me. And the basic document was written by the Examining Magistrate. Everybody whod ever been involved found out what I was researching. Word got around and they called me from all over the place. I was getting stuff from Sardinia, from Rome, from everywhere, even from South America. But, nevertheless, I tried to make a novel--I wasnt interested in a polemic because these things happen. I was interested in the fact that this is how history gets written and nothings going to change. So Guarnaccia does what I did and gets the real stuff and finds out the truth about things. But nothings going to change. Historys been written. Q: Is this a case of you, an author, as a repository of critical information? Nabb: Thats really inevitable. My researches went back as far as 1960 and the case is still open now. No officer stays in a place more than three years and many examining magistrates and prosecutors were involved over the years. When the first investigation was shut down in favour of the accusation against Pacciani there was a clean break. Even the head of forensics was replaced. No one involved ever had all the information after that. I had a problem with the information that came to me. I wanted to write a work of fiction but, at the same time, a man was on trial as a serial killer and I had information the could be used in his defence. I took it to his lawyers. They, unfortunately, told me that they knew very little about the case because it went back too far and they couldnt hope to study it in the time available. I gave them what I could and decided to make use of the newspaper. Again, because I wanted to write fiction and stay clear of the polemic, I gave information to a journalist who knew the case from the beginning and he published a series of articles on a daily basis during the appeal. This caused some excitement each morning in court but as to whether it was effective or not Ill never know because the Prosecutor General was an honest and sensible man who knew how things stood. Instead of making a speech for the prosecution at the end of the trial he said the case didnt hold water and Pacciani should be released. He was freed that same afternoon. Unfortunately, I then had trouble with the journalist who began selling my researches anywhere he could, including to the New Yorker. When he tried to sell to the RAI (Italian State Television) they wouldnt go ahead with their programme without seeing proof in the form of original documents. The journalist had to admit the stuff was mine and they came to me for it. I refused. It could have led to more unfounded accusations, the last thing I could allow. Q: Did the television program ever happen? Nabb: Yes, it did. But without this information which they couldnt use without my collaboration. I didnt see it. It might interest you to know, as a footnote, that this journalist is now being accused of involvement in the murders. Q: In your other books, youve taken real events, Why is this one so different? Nabb. Ive written up real cases beforeThe Marshals Own Case was one, for examplebut they were cases which had been solved and gone through the courts so that the documentation was available to me. This was different. It hasnt been solved and I had to document it for myself which was a very long and sometimes frightening job. It certainly made me realize that life must be very hard for policemen. I had complete liberty of thought and movement and nobody was afraid to talk to me. I could spend two years full time on one case and most people were beating a path to my door with information. I also learned that cases that seem to be acceptable enough in a court of law to send a man down for life on fourteen counts of first degree murder would be rejected out of hand if offered to a publisher by a humble crime writer.